What is post-modernism and how does Cold Mountain embody post-modernist characteristics? 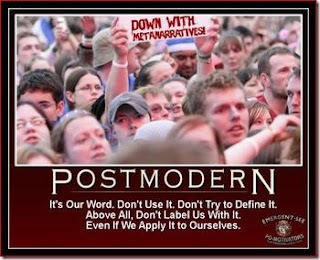 First: Is there a difference between modernist and post-modernist works? We're going to use poetry to compare and contrast modernist and post-modernist works. Note: The trinity, symbolized by units of three here in the three-line stanzas and the three types of evergreen trees, is replaced by the trinity of "nothing's" in the last stanza, making this poem, in my mind, the quintessentially nihilistic Modernist poem. And do we really need any more examples of Modernist works than these? The deep despair, the alienation from anyone and anything that is good or hopeful in the world. How did these people get up in the morning? And cooling shores, toward lost Amphibia^Rs emperies. Note: Wilbur imbues the toad's death with nobility, even going so far as to say the toad moves on to his Elysium, "Amphibia's emperies." Note: Give yourself a minute to recover from that poem. OK. Ready? Oy, poor Sylvia. I just want to hug her. Plath killed herself by putting her head in an oven, death of the "good little wife" and fulfillment of destiny as a Jew? sickness. Past cure I am, now reason is past care. if you loved me more intimately than anyone ever would? how could it be corrected? So what was I waiting for? the microbe adores the flesh it's dating. Note: Post-modernism plays with past genres and eras, often mixing them in fun and amusing ways. Modernism may use humor, but Modernist humor is dark and deeply chilling, a knife slicing cleanly through the heart. Conclusion: To me, there's a darkness and nihilism at the heart of Modernist works that is missing from post-modern ones. When I read a Modernist work, I seriously don't know how we humans are pretending we can make the world a better place. When I read post-modern works, I think we have a chance and I might be laughing at how that chance to improve the world has been presented. Is Cold Mountain a post-modern work? If so, how?